Result: Nearly all measured metal contaminants were detected in mussels from each of the sampling sites. Result: Organic contaminants and certain metals were more concentrated in mussels collected near cities and large river mouths, particularly in the southern portion of the Gulf of Maine. Explanation: Anthropogenic waste enters aquatic environments and accumulates in aquatic organisms, so it is not surprising to see higher concentrations of contaminants such as silver, PCBs, some pesticides, and PAHs in mussels near cities and river mouths. This result demonstrates one effect of urbanization on shellfish and other marine resources in some areas of the Gulf of Maine. Result: Tissue concentrations for a few contaminants at some Gulfwatch sites were elevated compared to other regions of North America, although except for lead in Boston Harbor, no contaminant concentrations exceeded any US Food and Drug Administration federal action levels for human consumption. Explanation: The National Status and Trends (NS&T) Mussel Watch program helps to place Gulfwatch data in a larger regional context. Gulfwatch values that exceed the national median include PCBs, mercury, and lead. Result: Analysis of five benchmark sites from 1991-1997 showed that most contaminants in mussels were decreasing or did not exhibit a trend. Explanation: Time trend analysis has been done for five benchmark sites for which there are enough years sampled to allow analysis. Preliminary analysis indicates that more metals than organic contaminants have been decreasing over time and that decreasing trends are more common at benchmark sites in the Bay of Fundy than those sites in the southern Gulf. Time trend analysis is a good example of how Gulfwatch data might be used to develop specific research or management questions on a local scale. Developing a baseline database for contaminant exposure concentrations for New Hampshire mussels in coordination with the Gulf of Maine Council’s Gulfwatch program. Determining the impact and fate of spilled oil in the biota of the Great Bay estuary. Developing a petroleum contamination baseline to assist in damage assessment in the event of an oil spill. Expanding coverage of sampling sites to include mussels in critical habitats along New Hampshire’s seacoast. The joint effort of the Gulf-wide Gulfwatch program and the New Hampshire program provides a model of how a regional database can help with interpretation of local study results. Contaminant concentrations that appear high within New Hampshire may be low compared to other areas in the Gulf of Maine, and the distribution of contaminants within New Hampshire compared with the Gulf of Maine provides clues about local versus regional sources of these contaminants. The effort also helped document the effects of an oil spill. In 1996, a thousand gallons of fuel oil were spilled into the Piscataqua River, causing concern about PAH contamination of the estuary. Gulfwatch had collected and archived mussel tissue samples in 1994, which provided background data on contaminant levels to assess the impact of the oil spill. 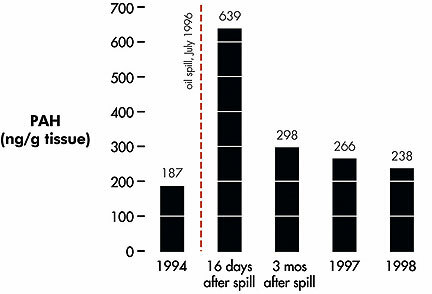 Gulfwatch quickly responded to the oil spill by collecting blue mussels 16 days and three months after the oil spill, and also in 1997 and 1998 to document recovery. Data show a spike in PAHs in shellfish following the oil spill, followed by a gradual recovery to near-background levels within two years. Long-term effects of an oil spill on PAH concentrations in mussels collected from Dover Point, New Hampshire. Tables of Gulfwatch data can be viewed online (HTML) or downloaded as tab-delimited text files or Microsoft Excel Version 8.0 for PC spreadsheets. To view or download data, click on a link in the table below. Links in the table indicate data file size. ND indicates No Data. The data provided below are provisional only. The data are currently under review and in the near future will be reposted in a new format similar to that used by the NOAA National Status and Trends Program Mussel Watch Project. NOTE: Excel 8.0 files are binary and will have to be viewed with Microsoft Excel. Download the Excel files to your local disk by holding the shift button while clicking on the filename. After you have retrieved the files this way you may load them into Excel.NOTE: Tab-delimited text files may be downloaded the same way as the Excel files and then imported into your favorite database/spreadsheet program.